COOL KA BA? STORE YOUR FILES IN STYLE! GET THE MOST MEMORABLE I.D. (The I.D. that has memory!) for a low, low price of only Php 349! Contact 09166355477 or approach me (or any SAMASKOMER) for orders! Hello! We are selling USB cards. It contains 2 GB memory. 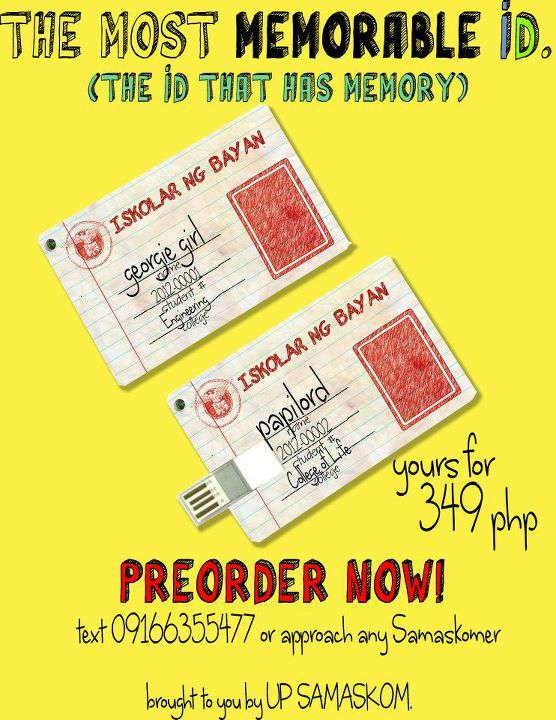 We sell it for only 349 pesos. If you want to order you can contact me or the number indicated in this pubmat. You need to pay first before you can get your USB card. No credits and 5 gives allowed. Your names can be printed on it using a marker. The names georgie girl and papilord are for sample purposes only. Support us! Buy this cool USB card. Support me! It’s my first time to put in something like this in my blog. This entry was posted in Uncategorized and tagged flash drive, Iskolar ng Bayan, merchandise, University of the Philippines, University of the Philippines Diliman, UP, UP SAMASKOM, USB card. Bookmark the permalink.